The stromboli was gone, so were most of the meatballs and baked ziti. Weren't they a high-wire act?? Well, mine weren't flying, but they sure were tasty. I took a picure of the sauce cookin'. hhhmmmmmmmmmmmmmmmm I bet your house smells SOOOO good right now...is Steve pacing the kitchen growling?? ahhhh....you like a "smooth" sauce? I'm like that too. I'm not a fan of onions, so I never have them in my sauces. Peppers either. Mushrooms are good, though. I like chunky meaty sauce.. I don't mind meat in the sauce. It can be tasty. Sometimes, I'll put pepperoni in the sauce. It can add some spiciness to it. Lotsa' onions, black olives, and mushrooms--and olive oil. Although I like green pepper, I don't put it in the spaghetti sauce. 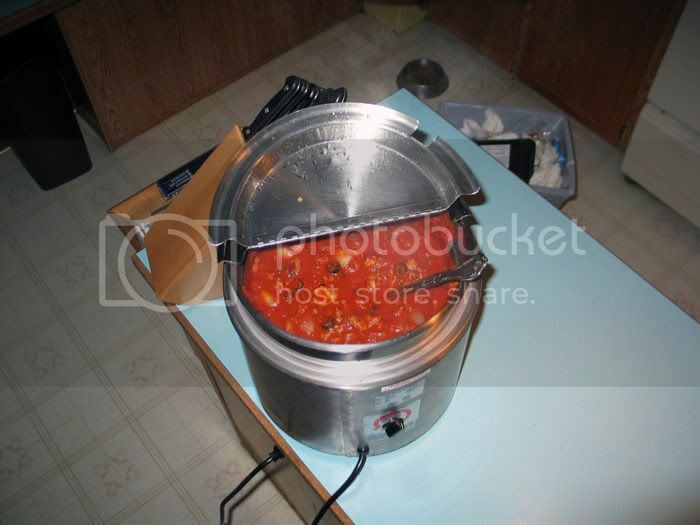 And Jess, yeah the house smells great--mainly because of the sweet Italian sausage (beef is for chili ). Steve just came in from unloading the last truck-load of wood. There is an east wind blowing, and it's very mild outside. They day was beautiful. Now I gotta' put the bread in the oven.